The most famous marionette of all is beautifully rendered here in hardwood, felt and fabric. 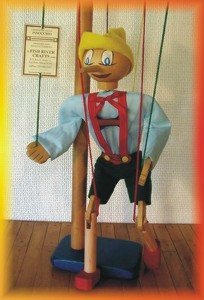 When you see him spring magically to life with a few rocks of the control-bar, you will understand why this has been our best-selling marionette for 22 years. Our handmade, wooden Pinocchio is a classic ‘sculpture in motion’ that will delight young and old alike.